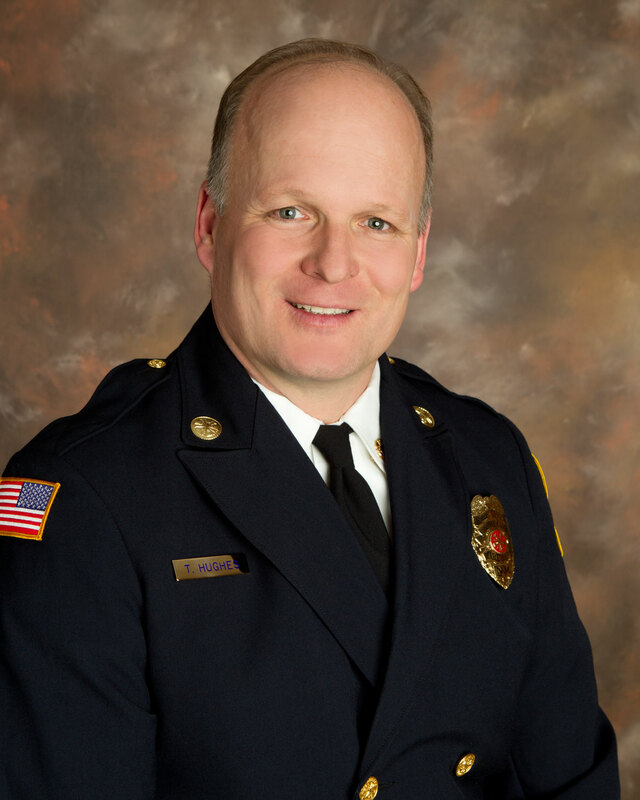 Troy Hughes- Fire Chief Los Alamos Fire Department (LAFD) is the third largest career fire department in the state of New Mexico. 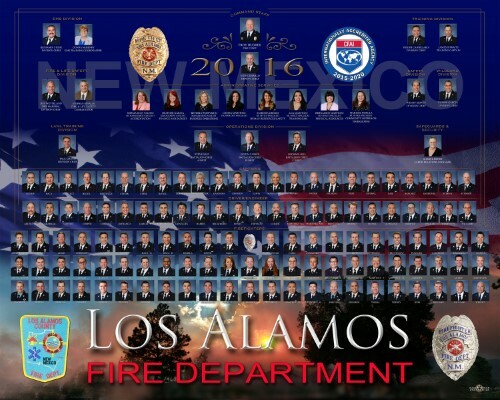 The department provides a multi-disciplined, multi-dimensional mission of fire, rescue, emergency medical, public education and life safety services to the citizens and visitors of Los Alamos County. Included in the services LAFD provides are the protection of the Los Alamos National Laboratory (LANL),a large nuclear research and development complex; protection of the communities of Los Alamos and White Rock; and assistance in the provision of emergency response for an extensive urban wildland interface. LAFD was organized under the Manhattan Project in April 1943. At that time it consisted of 7 civilian firefighters and 25 volunteer firefighters. In September 1943, the firefighter functions were taken over by the military. The Fire Department was governed by the US Atomic Energy Commission and the US Department of Energy (DOE) until the Incorporated County of Los Alamos took it over in September 1989. Today, LAFD operates 6 fire stations with 150 budgeted positions,130 shift firefighters including 3 shift Battalion Chiefs, 9 Chief and Staff Officers assigned to days and 13 civilian support staff. Effective immediately Los Alamos County will drop from Stage I Fire Restrictions to Baseline Fire Restrictions. Los Alamos County has seen some much-needed relief with the extreme drought conditions that led to the strict Fire Restrictions. Several criteria are used to determine when to implement fire restrictions, including current and predicted weather, as well as fuel moistures. Los Alamos County Fire Department asks that everyone please continue to use extreme caution and practice fire safety. Los Alamos County Fire Department urges the public to take every precaution necessary on all properties to prevent a fire. Fireworks and incendiary devices are never allowed on federal public lands. Outdoor burning on public land in Los Alamos County is only allowed in approved fire rings at Camp May Campground. National Parks, Monuments, Preserves and Wildlife Refuges host year-round fire restrictions. Contact Bandelier National Park and Valles Caldera if you plan to visit for specific restrictions. Follow the USFS and NM State Forestry Restrictions when outside of the municipality of Los Alamos. Visit http://www.emnrd.state.nm.us/SFD/ or https://firerestrictions.us/ for more information. Fire Danger Levels Explained page. Los Alamos Fire Department is honored to be entrusted with the safety and welfare of our community. We are dedicated and proud to provide exceptional services for the preservation of life, the environment, and property. The Los Alamos 2024 vision is to continue to be widely known as an internationally accredited fire service agency that serves with PRIDE, while meeting our mission for our community. Looking toward the futurity we seek, we will continue to strive for excellence with all of our pursuits. Our enhanced communications, both internal and external, will help us further connect with the people of Los Alamos, as well as become a more effective and efficient organization. Acknowledging that we value professionalism, we will invest in our greatest asset, our members, through our initiative that focuses on improved leadership. This, along with comprehensive succession planning, will help move the department forward, sustaining and growing the quality that is the Los Alamos County Fire Department. For us to demonstrate our readiness, our training initiative will bolster our ability to safely serve those who entrust us with the responsibility of their safety and welfare. Dedication to those we serve and ourselves will be the mainstay in all that we do, while always personifying our traditions and calling by holding each other accountable for fulfilling our mission, living our values, accomplishing our goals, and bringing this vision to fruition.
" We Walk With P.R.I.D.E"
Professionalism is the foundation of our general culture and guided by our commitment to public relations and external communications initiative ensuring an enhanced interaction with the community we are honored to serve. Readiness is demonstrated by our training, technology, physical resources, and our commitment to continuous improvement. Integrity is demonstrated by doing the right thing on and off duty for the benefit of our department and the community. Dedication to the improvement of the community and the safety and well-being of our fellow team members. Excellence is at the heart of our individual and department goals, recognizing that we are entrusted with the safety and welfare of our community. Accreditation—it’s not “just a plaque on the wall”. It’s a journey. Someone once said that athletic activities would be a big waste of time if they didn’t keep score. No one really wants to watch a lot of physical effort between two groups of individuals unless they can determine who did the best job of playing the game. In our industry, the two opposite sides are the fire service effort as waged against the problem or accident. In the context of the accreditation concept, the CFAI has adopted the use of two different ways of keeping score. They are called baselines and benchmarks. •	A baseline is defined as a database from which something can be judged. It also refers to current and historical performance. •	A benchmark is defined as a standard from which something can be judged. It refers to future performance goals. Searching for industry best practice will help define superior or benchmark performance for which an organization can strive to meet. If we want to improve in our continuous drive for excellence, we must determine the organizational direction for excellence and develop a strategy for getting there. A properly developed strategic plan steers an organization from “business as usual” towards attainment of excellence by tackling areas needing improvement. Matching resources to the risk using a methodology of identifying community hazards and risks, fire station distribution relative to the unique hazards, risks, population densities and service demand. The concentration of resources is established along with call type critical tasking, equipment needs and performance measures. The primary purpose of an internal self-evaluation is to determine the current, or baseline performance of each of our services and programs. The second is to determine industry best practices and local expectations for the services and programs resulting in the development of plans for improvement. These plans must have a direct relationship to the department goals and objectives. The final reason is to provide a process by which to evaluate our services and programs in relation to improving the quality of the department and increasing the safety, effectiveness and efficiency of the agency. Accreditation is a comprehensive self-assessment and evaluation model that enables organizations to examine past, current, and future service levels and internal performance and compare them to industry best practices. This process leads to improved service delivery. •	Determine community risk and safety needs and develop community-specific Standards of Cover. •	Evaluate the performance of the department. •	Establish a method for achieving continuous organizational improvement. The CFAI accreditation process provides a well-defined, internationally-recognized benchmark system to measure the quality of fire and emergency services. For more information on the Center for Public Safety Excellence (CPSE) visit their webpage. For years prior to 2013, please click here for information to make a Public Records request.